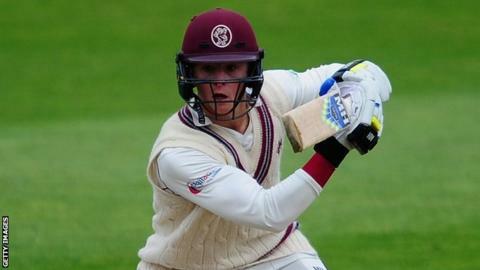 Opener Tom Abell batted impressively as Somerset made a positive reply to Hampshire's 338 all out on day two of their Championship game at Taunton. Abell hit 11 fours in his 79 before falling lbw to debutant spin bowler David Wainwright (2-70). Peter Trego (42) added 69 with Jim Allenby (37 not out) before bad light ended play with Somerset on 257-5. Earlier, Jack Leach picked up three more wickets after Hampshire resumed on 281-6 for figures of 6-108. It was a fine effort by the 25-year-old slow left-armer, who now has 40 victims this season at a cost of only 23.5 runs each. His success meant it was no surprise that Hampshire turned to spin after only six overs of Somerset's reply. And it was Wainwright, plucked from Minor Counties cricket, who broke an 87-run opening stand when Marcus Trescothick (36) holed out at long-on. There was brilliant work by wicketkeeper Lewis McManus, when he stumped Chris Rogers down the leg-side off leg-spinner Mason Crane for 11, while skipper Will Smith had James Hildreth (40) leg-before.